It’s that time of year again! The weather is changing and each day it’s getting warmer and brighter. Soon the “dog days of summer” will be upon us. Now is the time to be thinking of how you are going to prepare your yards and gardens for new growth and for all those great blooms and blossoms. Don’t forget your greyhound(s) when you start working in your yard and garden. Keep in mind that some lawn care products can be hazardous to your hounds. If you have a lawn care service, please ask them what types of fertilizers and pest sprays they use. Most chemicals today are safe for pets, but remember that our hounds have much thinner skin and can get sicker faster if subjected to strong doses of even safe chemicals. 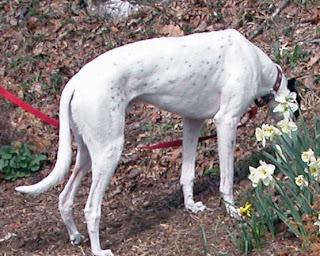 Your hound may not ingest any chemicals directly from your landscape, but a dog licking its paws can unwittingly dose itself with the chemical it walked in. None of us want to have to bear the loss of a pet because we didn’t pay attention to the types of chemicals that we used to make our yards look nice. The best advice is ALWAYS BE AWARE. The warmer weather brings more opportunities for taking walks with our hounds. Now is the time to inspect all collars and leashes for wear. Check all webbing around the collars to make sure there are no cuts or fraying. Leashes that are cut or frayed in any way should be thrown out. Also, check the hardware on the collars to make sure there are no splits. The D-rings in some martingale collars are made from one piece of wire that is then shaped into the D-ring. These are not safe as pressure on this hardware may split the ring and open it enough for the cloth part of the collar to slip through. When buying a new collar, make sure that the D-ring is all one piece. Inspect the clips on leashes to make sure they work properly. Nothing is more frightening to have a hound slip the leash because the clip sticks or comes loose. It’s also time to bring out the heartworm preventative and flea and tick preventative. Many people do not use these products in the winter and may forget when spring comes to start using them again. We recommend strongly (and hope that you agree) that heartworm and flea/tick preventative is worth the cost of not having to worry about your hound’s well being. You can get these preventatives from your vet and on line. The heartworm preventative is not available in any pet food or supply stores. Before you give your hound a heartworm preventative, please make sure that he/she is heartworm negative. You do not want to give this medication to a hound that tests positive for heartworms. Your hound can get a heartworm test at your vet. You may also want to check your hound’s vet records to determine when the last heartworm test was done and to make sure that all other shots are up to date. Heartworm preventative is taken once a month. You can usually buy it in a six month supply. Your vet may carry several brands to choose from, but some only carry one brand. While you can shop on line for this preventative to save money, most companies will require an “OK” from your vet (to confirm that your hound is negative for heartworms) before they send you the product. If your vet objects to this, ask if he/she will be willing to price match. You do not need a “prescription” from your vet to shop for flea and tick preventatives, and you can most likely save money by comparing prices on line (remember to add in shipping costs!). There are many different products to choose from. However, DO NOT use a flea collar on your hound. These items contain toxic chemicals and your hound’s thin skin will absorb the chemicals quickly and make him/her sick. If you need advice on which types of preventatives to use, please email us and we’ll try to help.